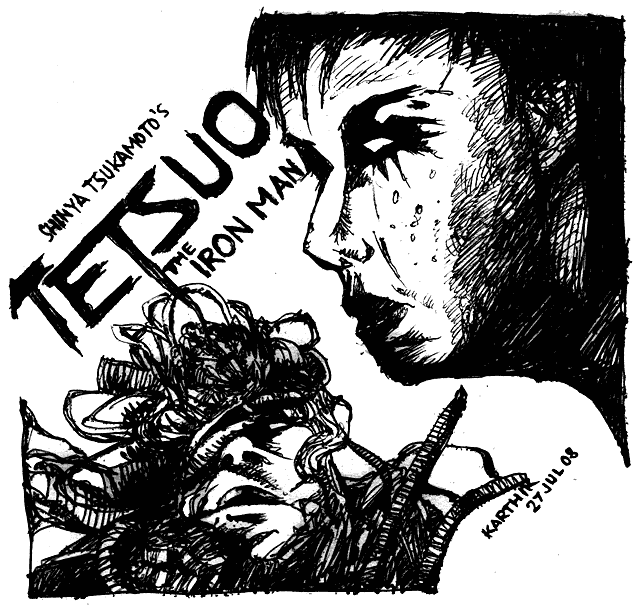 Tetsuo: The Iron Man is a film from Japanese director Shinya Tsukamoto. It begins with a character called the "Metal Fetishist" inserting rods of metal into his body. Subsequently, the Metal Fetishist is run over by a Salaryman (an office worker). What follows is a bizarre sequence of events and images, where the Salaryman apparently starts mutating into a metal creature, with wires and other objects of metal emerging from his body. This is a nightmarish film that is shot in black-and-white, with very little dialogue and a grungy, decayed look. Shinya Tsukamoto wrote and directed the movie, and also stars as the Metal Fetishist — which makes one question his sanity! One could compare this with a David Cronenberg movie, where "metal is the new flesh". The movie is well made and has some very good effects and visuals, all accomplished on a low budget. It is one of the weirdest movies I have seen (the weirdest would be David Lynch’s Eraserhead, but this also comes close), and I would recommend watching it if you have a taste for stuff like this. Beware though, that it contains some explicit content and is definitely an adults-only film. Shinya Tsukamoto made a sequel to this, called Tetsuo II: Body Hammer which I have not seen. Rating: 7/10. And as you might expect, I did a drawing based on this movie which you see above. It was done in ballpoint pen and shows the Metal Fetishist on the top right, with the Salaryman in an advanced stage of "metal mutation" on the bottom left. You can click it for a larger version.